I mentioned in a previous blog entry that a cool Carolina breeze and great live music always puts a smile on my face. So thanks to a beautiful North Carolina evening and the Jerry Garcia Symphonic Celebration featuring Warren Haynes at Red Hat Amphitheater (500 S. McDowell St.) in downtown Raleigh, I was smiling ear to ear last night. From the nationally-known bands the venue brings in, to the towering stage, to the scenic view of downtown Raleigh, to the selection of exquisite food and craft beers and more, Red Hat Amphitheater offers a very special and unique place to take in live music. I love all genres of music, and the venue surely brings in a wide variety of touring bands to downtown Raleigh. Bob Dylan performed earlier in June. Just several days later, Smashing Pumpkins rocked the venue. And last night, rock and blues guitarist, vocalist and songwriter Warren Haynes teamed up with North Carolina Symphony to put on a concert celebrating the music and life of rock legend Jerry Garcia. I arrived at the venue gate as early as possible, eager to scope out the scene and to begin enjoying a much-anticipated night of live music. I highly suggest to go to the concerts with an appetite. Local, award-winning barbecue restaurant The Pit offers their mouthwatering barbecue sandwiches and fried chicken sandwiches. Pair up the delicious food with a selection of 13 different beers. Local beers served includes brews from Big Boss Brewing Company and Lonerider Brewing Company. The venue also has a cocktail bar where crowd favorites and other creations are served. For the kids, the venue serves up thirst-quenching Pepsi drinks, slushies, hot dogs, popcorn and other treats. Waiting for the show to start, I took in the magnificent view of downtown Raleigh from the venue. 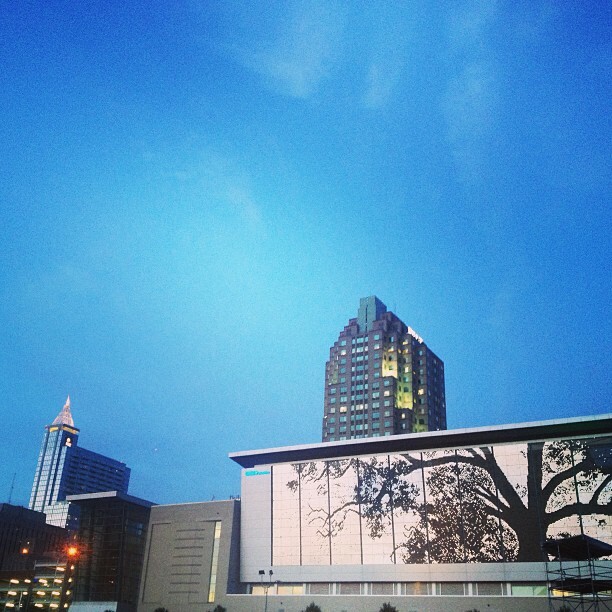 Opposite the direction of the stage is Raleigh Convention Center with its grand Cree Shimmer Wall displaying an oak tree that shimmers with an array of vibrant colors when the sun sets. Much of downtown&apos;s tallest buildings are visible from the amphitheater as well. The 5,500-capacity Red Hat Amphitheater provides a spread-out space to enjoy outdoor shows comfortably. The venue provides seven seat sections, 26 boxed areas with seats and tables and a lawn area. VIP patrons had waitstaff service. For some shows, a general audience pit is sectioned off and the area will have no seats. For the Jerry Garcia Symphonic Celebration featuring Warren Haynes, all seats were in place so concertgoers could sit back and relax right in front of the stage, and in other areas. Check out the layout of the venue here. Closely watching the stage, on the edge of my seat waiting for the show to start, I saw the symphony slowly fill up the stage and after a few moments, Warren Haynes took to the stage. 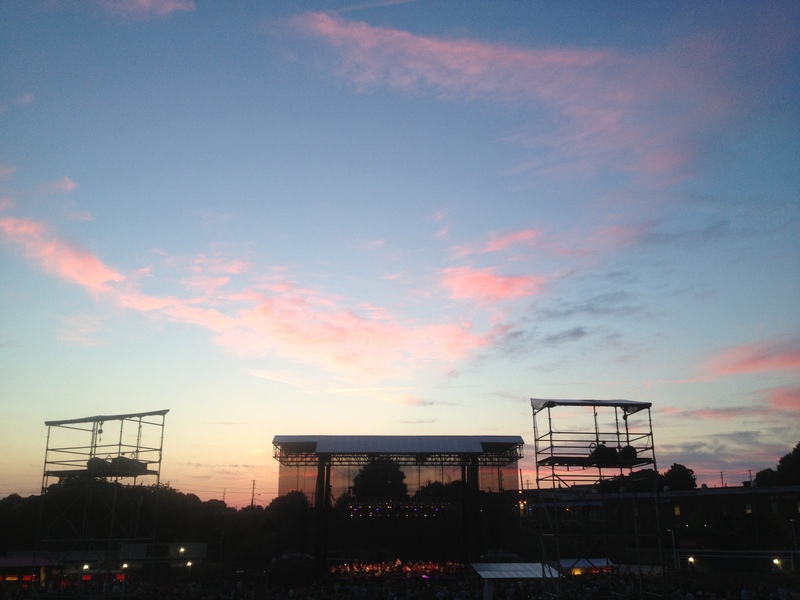 Grateful Dead, Jerry Garcia, Warren Haynes and North Carolina Symphony fans erupted in applause, whistling and cheering. Many fans of Jerry Garcia gravitate towards the bluesy, soulful sound of Warren Haynes&apos;s guitar playing and vocals, so the combination of Garcia&apos;s songs and Haynes&apos;s guitar playing and singing was magnificent. 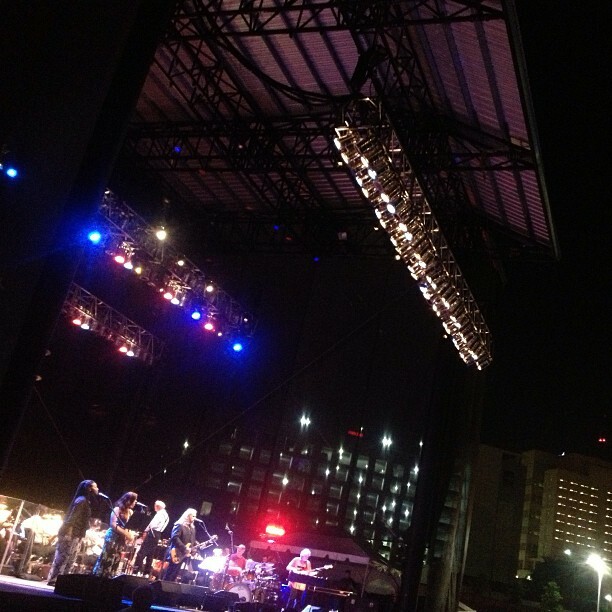 The music began and the crowd cheered on Warren Haynes and North Carolina Symphony. The volume was perfect and the blend of the soothing symphony sounds with Haynes&apos;s smooth, round guitar tone filled the venue beautifully. Haynes&apos;s raspy voice was complimented by the relaxing symphony sounds. Other than Haynes and the symphony, the musicians on stage also included a drummer on a full drum kit, an electric bass player and two backup vocalists (these were musicians that play with Warren Haynes at many shows). One of the many things about that venue impresses me every time I take in a show there is the sound quality. The venue&apos;s team of seasoned sound technicians paired with the collection of enormous speakers makes for a system with just the right amount of volume and a comfortable tone. The show was amazing. Haynes and the symphony played their hearts out, celebrating the life of a man who wrote some of the most well-written songs in rock history and made an everlasting, everlasting mark in the world of music. Jerry Garcia&apos;s songs rang through the downtown area where the venue sits. Some highlights from the two-and-a-half hour set included "Uncle John&apos;s Band," "Terrapin Station," "Dark Star," "Stella Blue" and more. Throughout the show I kept wondering, "How exactly did this very unique show come to fruition?" Warren Haynes announced at the show that the Jerry Garcia estate called him and asked if he&apos;d like to be the first vocalist/guitarist to be featured at a Jerry Garcia Symphonic Celebration. He mentioned that he was honored and very happy to play. I also asked North Carolina Symphony director of communications Joe Newberry how the show landed in Greater Raleigh. He explained that the stars aligned and it came together just right (the chemistry, the date, the venue; the timing of the show-planning process was perfect). Only select symphonies were chosen for the concert, and the Raleigh show was the only show in the Southeast on the tour. The Red Hat Amphitheater was the perfect venue for a show like this. Wide open, spacious and laid back. The setting sparks a social atmosphere and I honestly didn&apos;t see one face with a frown. After all, Jerry Garcia fans tend to be happy people. Throw in a Carolina breeze, great food, a picturesque view and you have the ingredients for a celebration. And that&apos;s just what this concert was. Miss the show? Don&apos;t sweat it! Greater Raleigh has more live music that any other destination in N.C., so you know the Red Hat Amphitheater has a big lineup of shows coming up this summer. Check out the schedule here. The North Carolina Symphony always impresses. After the show last night, the Classical Mystery Tour featuring The Beatles hits and the Symphonic Mashup: The Music of Radiohead Meets Brahms, it&apos;s proven that the North Carolina Symphony can rock and that it can entertain all sorts of Music Maniacs. Coming just around the corner is the Sci-Fi Spectacular event on Thurs., June 27, and Fri., June 28. George Takei, “Mr. Sulu,” of Star Trek will be in Greater Raleigh to narrate your journey through the galaxy, live, accompanied by music from E.T., Star Wars, Close Encounters of the Third Kind and, of course, Star Trek. A must-see for Trekkies! 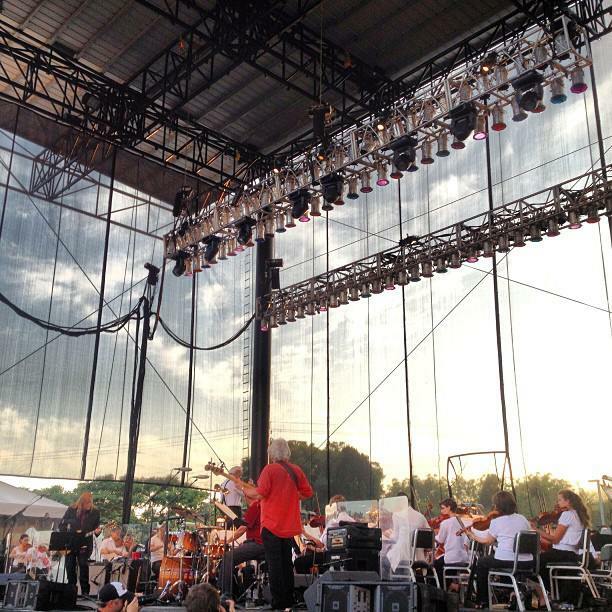 Join the orchestra for an evening of mega-hits from Broadway at NC Symphony Summerfest Series presents Broadway Blockbusters on June 22 at Koka Booth Amphitheatre in Cary. Songs include “I Dreamed a Dream” from Les Miserables and “Music of the Night” from Phantom of the Opera, plus hits from The Sound of Music, Music Man and Fiddler on the Roof. The shows don&apos;t stop this summer in Greater Raleigh. 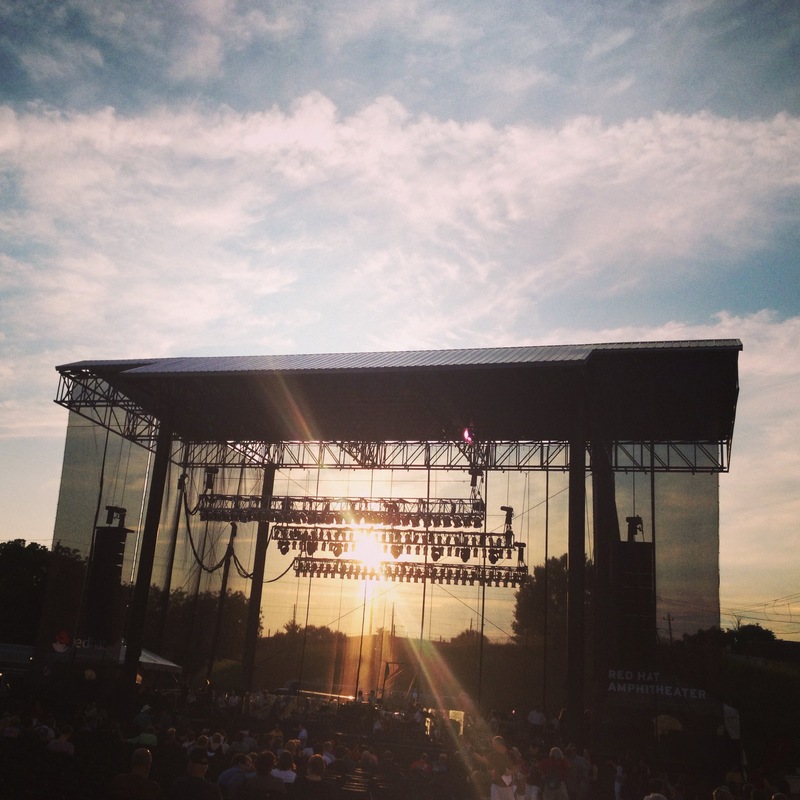 Take in a wall-to-wall summer of music in Greater Raleigh!